Baseball is back and the first weekend of action has provided fans with plenty to get excited about. There have already been several extra innings contests, as well as some excellent pitching performances and monster home runs. With that being said now is a good to time to reflect and take a look at the five biggest surprises from Opening Weekend. At the outset of the season nobody thought that the Toronto Blue Jays would be a competitive team in a loaded A.L. East. While this still may be true of a Blue Jays team that is in a clear rebuild, they have impressed through their first weekend of action, particularly on the mound. The Toronto starters compiled 24 straight innings of scoreless baseball to begin the season. It started opening day when Marcus Stroman went seven strong innings giving up just two hits and striking out seven batters. Matt Shoemaker followed with an equally strong outing in his Jays debut racking up seven strikeouts over seven scoreless in a 6-0 win over the Detroit Tigers. Right hander Aaron Sanchez turned in five scoreless followed by rookie Trent Thornton who did the same in his major league debut. Thornton also set the record for most strikeouts in a debut by a Blue Jays pitcher with eight over his five innings of work. As a staff the starters have been nothing short of dominant, and while Detroit isn’t a powerhouse offense it is still encouraging to see these quality outings turned in. The only blip on on the radar for the Jays starters has been a rough three inning outing by Sean Reid-Foley against the Orioles in which he was tagged for five runs. In addition to the starting rotation the Toronto bullpen has also been extremely sharp. In their opening series against the Tigers most of the pen saw action. The highlights included Joe Biagini looking dominant in his new role as the setup man as well as Ken Giles tossing scoreless innings in three of the four games. The only blips came when Daniel Hudson allowed a home run in the opener and Javy Guerra’s rough inning in the series finale. Overall to this point the Blue Jays staff has a combined ERA of just 2.39 which has been a huge surprise considering how much pitching was an issue for this team just a season ago. At the outset of the 2019 season the Seattle Mariners were thought of as a rebuilding team. However that hasn’t been the case to this point. The Mariners have come out of the gates firing winning seven of their first eight games including taking three out of four against the defending World Series Champion Boston Red Sox. The thing that has been most surprising about Seattle so far has been their bats. It seems as though every batter who steps to the plate is sending a ball into the seats. The club has hit a whopping seventeen home runs, good for second in the league behind the Los Angeles Dodgers who have eighteen. This is a huge surprise because outside of the newly acquired Edwin Encarnacion and Ryon Healy, the Mariners don’t have a lot of established home run hitters. However it has been outfielder Domingo Santana and infielder Tim Beckham have been providing most of the power with three home runs each in the early going. In addition to these two players Jay Bruce has also chipped in three long balls. Seattle’s power surge and MLB best 7-1 record made them an easy choice as an early season surprise. In what could be the biggest shock of the season so far, the Boston Red Sox sit at a measly 2-5 good for last place in the A.L. East. Whether you want to chalk it up to a tough west coast road trip to begin the year, or a championship hangover, the Sox just haven’t looked like themselves to this point in the season. Ace Chris Sale has seen a major dip in the velocity of his fastball going from 97-99 in 2018 to 90-93 in his first two starts in 2019. The pitching staff as a whole has looked rough to this point giving up way too many home runs to give the offense a chance to win games. At the beginning of the season fans and media alike thought that the lack of a closer and the thin bullpen would hurt the Sox, and so far it has been quite the opposite with the starting rotation getting roughed up night in and night out. As for the offense, well it hasn’t been much better. Before last night’s game the club had gone almost three whole games without scoring a run, a far cry from last year’s elite offense. 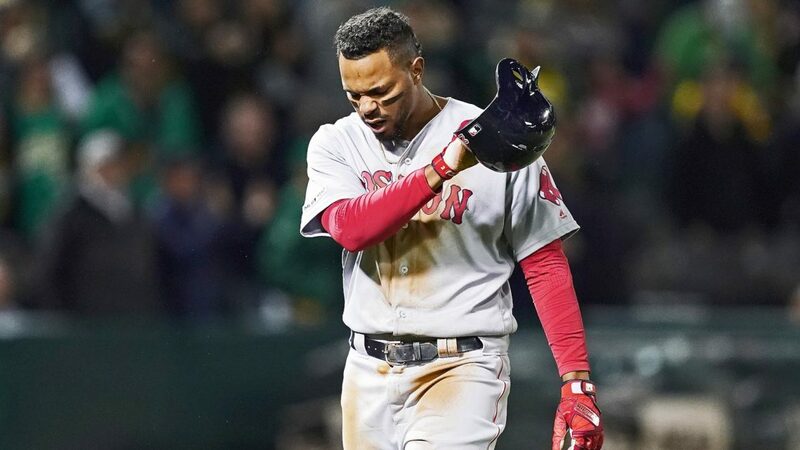 A lot of the Sox early struggles can be chalked up to nothing more than a slow start, and with only a week of games under their belt it is far from time to panic. However to see such a rough start from such a talented group is definitely surprising. Extensions have been coming early and often this season. With all star caliber talents like Dallas Keuchel and Craig Kimbrel still on the market it seems as though players want to avoid hitting free agency. So far we have seen players such as Ronald Acuna Jr., Eloy Jimenez, Chris Sale, Randal Grichuk, and Jacob deGrom sign lengthy extensions with their clubs. It is both surprising and refreshing in an age of frequently changing teams and looking for the most money that players are beginning to stay with organizations for the long haul, even though it may be dictated by a terrible free agency market. Out of all of these extensions the most shocking one had to be the White Sox giving a contract extension to top prospect Eloy Jimenez before he even played in a major league game. It was surprising enough to see so many star players opt for extensions rather than the open market, but to see a rookie with no MLB experience sign a long term deal was extremely surprising. You may be thinking “Well wait a minute Yelich won the MVP last year, how is this a surprise?” Well the answer to the question is simple. Christian Yelich’s home run streak of four straight games to begin the 2019 season tied the MLB record. While it is now common knowledge that Christian Yelich is one of the best players in the league I don’t think anybody saw this start to the season coming. At the time of writing this article Yelich is hitting .375 with four home runs and eight RBI. Yelich’s absolute torrid start to 2019 comes right on the heels of a 2018 campaign in which he took home National League MVP honors during his first season as a member of the Milwaukee Brewers. Fans likely expected Yelich to get off to a quick start, but it has been quite a surprise as to just how great he has been to start off the 2019 season.